Former governor Jim Douglas shakes Sargent-at-Arms Francis Brooks' hand at the Statehouse last month. Weeks after protesters filled the House chamber and interrupted the governor’s inauguration, the man in charge of running the Statehouse faces competition for his job. Two challengers are running against Francis Brooks, who has been sergeant-at-arms since 2007. The legislature on Thursday is to elect one of three candidates to a two-year term. Janet Miller, who is director of operations for Legislative Council in the Statehouse, and Chuck Satterfield, a part-time detective with the Northfield Police Department, are challenging Brooks. Brooks said he was surprised by the challenge. “It bothers me that people are supposedly upset or whatever and I can’t honestly tell you why,” Brooks said. Brooks, 72, is a former Montpelier High School teacher and state representative. As sergeant-at-arms, he is in charge of daily operations of the Statehouse, including security, delivering messages to legislators and the scheduling of conference rooms. Poirier said he’s heard complaints that some people think Brooks is grumpy. “He’s not grumpy to me,” Poirier said. Others complained that Brooks has been unresponsive to legislators' concerns and hasn’t done enough to recruit eighth-grade pages from throughout Vermont for three-month stints at the Statehouse. The January 8 inaugural protest brought the discontent to the forefront, however. Scores of protesters, angry over Gov. Peter Shumlin’s decision not to pursue single-payer health care, filled the House chamber as Shumlin delivered his speech. They chanted and unfurled banners, which Brooks and his staff immediately hauled down. 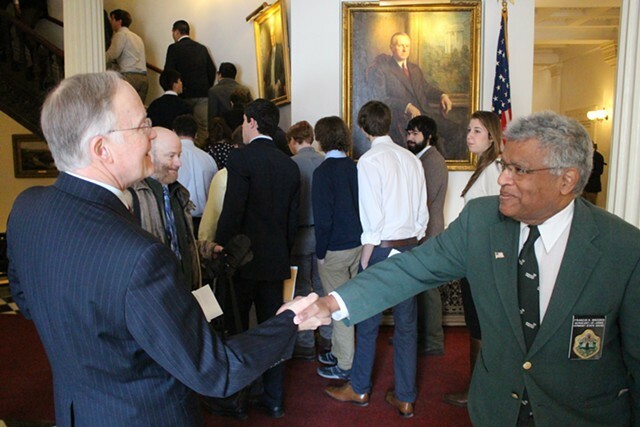 Protesters clogged the chamber's doorway, forcing Shumlin to exit through the back door. Protesters refused to leave and 29 were arrested. Many legislators characterized the incident as crossing a line on civility and wondered whether Brooks and his staff should have done more. A month later, hundreds of people turned out for an evening public hearing on proposed gun legislation. Some legislators said they felt intimidated by the heavy turnout of gun-rights activists and wondered whether there should have been a larger security presence. It’s unclear whether those questioning how Brooks handled the situation want more restrictions on Statehouse access. Traditionally, one of the hallmarks of Vermont’s capitol building has been its openness. Both Miller and Satterfield mentioned security as an issue. Miller, 58, of Montpelier, has worked for Legislative Council in the Statehouse for 15 years. Since 2007, she has been the office’s director of operations, overseeing the legislative staff. She said her experience gives her a good overall knowledge of Statehouse functions. Miller said she had no comment on whether Statehouse security should be changed. “I want to get all the facts. I would want to take everything under consideration,” she said. Satterfield, 60, of Northfield, used to work as a lobbyist in the Statehouse. He also worked for the Governor’s Highway Safety Program for nine years and has been a part-time officer with the Northfield Police Department for 10 years. His wife, Kathy Satterfield, served as assistant sergeant-at-arms, and briefly was appointed sergeant-at-arms to fill the remainder of a term in the 1990s.